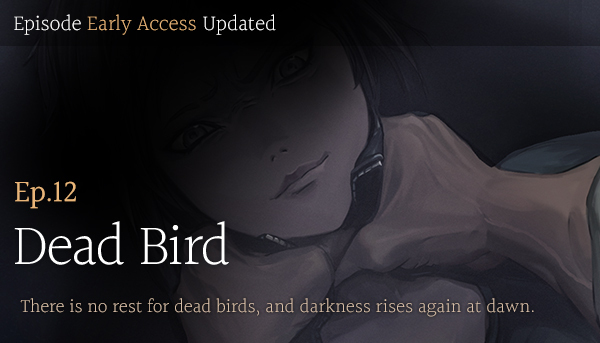 The last episode of White Island's Season 2, Episode 12, "Dead Bird," has been updated for early access. The precious feedback we receive from users, will be reflected in the official episode. Finally, the story of White Island Season 2 has come to an end. Many of you might have wondered about the conclusion of Season 2, especially users who bought the season pass earlier have been watching for so long. But above all circumstances, we truly apologize for the long wait, and we know that many of you have waited with us more than necessary. With this in mind, we would like to present a small gift to the users who purchased the season 2 pass long ago. We know this isn't enough as a reward for waiting, but we hope that our hearts will be conveyed to you a little bit this way. The detailed reward list is as follows. **The rewards are only for users who purchased Season Pass 2 before February 22nd (Thursday) 22:00 (GMT+9). **Please note that users who purchased Season Pass 2 after February 22nd (Thursday) 22:00 (GMT+9) will be paid just 'Sunny' to Blustone. **End of Season 2 Celebration limited-badge will take a little time to distribute, so we will be able to a make an announcement again in the future after we have confirmed a time. Also, we are internally discussing the official release of the episodes, including episode 12, and we will be able to notify everyone when there is further confirmation. Finally, we would like to thank everyone who has been with us until the end of White Island Season 2. This isn’t the end. This is just the beginning of what is yet to become. Awesome:-) so the official release of the last three episodes is still approximately months away? What password card four buttons very hard. Heavy gas on oxygen full. Hello, we have not decided the exact official release dates yet but it will be soon announced here. Thank you. So will there be a season 3?? I think I purchased the season 2 pass before the 22nd? I don't know... Guess I'll have to wait and see. I think I remember seeing a season 3 on the Korean website. Hello, actually season 3 has never been released in Korea. Season 3 hype is real right now. NOOOOOOOOOOO!!! YOU! CAN'T! DO! THAT! TO SUNNY! WHY?!?! HOW COULD YOU?!?! Hello, if you would like to report a bug please make a post on Support. Thank you! I'm really happy with this game, not only with this season. I was in depression and this game make me happy, excited and I begin to see that we need live our life with happiness, we don't know who we lose tomorrow or what will happen... I just wanna say thanks to all of you that worked in this game, i'll wait for the season 3!. A huge success to you guys. From the deep of my heart! Thanks!! Is Season 3 a possibility? Hello, season 3 is a possibility. I hope you make a season 3! The story cant end there!!!!! Thank you for your interest in season 3, we will do our best to make season 3 possible. Please write on Support and tell us the nickname you are using with BTB.